If Tuesday belonged to BJP chief Amit Shah—Wednesday belonged to Didi. If Tuesday belonged to BJP chief Amit Shah—with his “hum himmat dekhaye” (we showed guts) speech on the NRC-Assam in the Upper House, his ladoos to PM at the BJP parliamentary party meet for winning the non-confidence motion, the hard-hitting presser thereafter (to counter Mamata Banerjee on the NRC) at the BJP headquarters—Wednesday belonged to Didi. 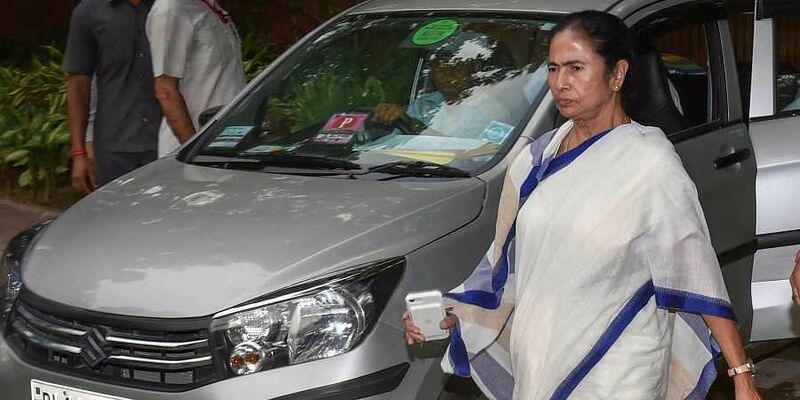 No sooner had the Bengal CM descended on Parliament House, stationing herself at the TMC parliamentary party office, the opposition leaders, beginning with Ghulam Nabi Azad and Ahmed Patel, made a beeline for her. She seemed to be the centre of gravity. A three-member TDP delegation, a lone SPY Reddy of YSRC carrying single stem pink rose, dropped by. The surprise visitors, though, were AIADMK’s M.Thambidurai, Shiv Sena’s Sanjay Raut and BJP rebel Kriti Azad. Not Jaya Bachchan of SP or Misa Bharati of RJD. All these happened between media bytes on the problems relating to the NRC—the Bengali names of genuine citizens missing, of what it means to alienate friendly neighbour Bangladesh by terming their citizens as ‘security threat to India’, et el. Known to spring surprises, Mamata walked over to BJP veteran L.K. Advani's room in Parliament, ostensibly to enquire about his health. All this before she buzzed off to meet Sonia Gandhi and Rahul Gandhi. A meeting with former PM Deve Gowda, too—all to stitch up a wide coalition where “amra sabai raja” (we’ll all be equals). Well, BJP chief Amit Shah is no pushover either. Didi may have stolen some of the limelight on Tuesday with her loud warnings—“civil war”, “bloodbath”—and may have dominated the Parliament arena without being at the House, but Shah did slip his point. In a clear indication that BJP is neither going to be cowed down by the opposition nor give any quarter on the NRC Assam issue, Shah himself got up to speak on the issue, second day running, as part of a short duration discussion. Of course, a rather belligerent TMC aided by the rest of the opposition did not quite allow Shah to have his say fully, but he manage to slip in the point that Rajiv Gandhi, while signing the Assam Accord with the then student leaders of AGP, had agreed to identify and deport illegal Bangladeshi immigrants. The Congress was embarrassed enough for Patel to issue a counter on Twitter. In the midst of the political slugfest over NRC, LJP chief and Union Minister Ram Vilas Paswan looked rather pleased. Well, it became apparent by evening, why. Post-Cabinet meeting, the government announced it has decided bring a Bill to restore the SC/ST Prevention of Atrocities Act to its original form.